CodeMonkey Releases its First Math & Coding Courses! CodeMonkey just released its very first Math and Coding Courses! Dodo Does Math is CodeMonkey’s all new game-based platform for students to learn and practice math! 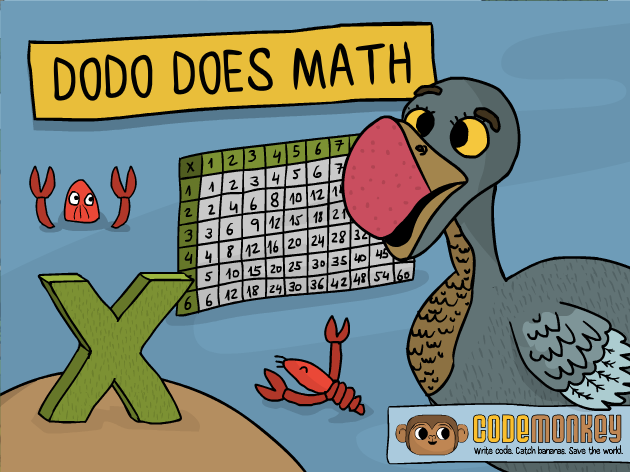 With the same easy-to use interface enjoyed in CodeMonkey’s Coding Adventure, Dodo Does Math consists of three courses, with 20 challenges per course. In these challenges, students get to improve their math skills with exciting new characters, features and challenges. The objective of the courses is for students to use math and coding to help the Dodo get to the eggs. In Dodo Does Math: Distances, students practice distances with an interactive platform where they add, subtract and measure using a life-like ruler. In Does Does Math: Angles, students use a life-like protractor to measure angles. This course incorporates writing real code as users need to add angles and distances together to help get the dodo to the eggs. The third courses, Dodo Does Math: Multiplication, helps students practice the fundamentals of multiplication. Like the previous courses, students will gain knowledge through cumulative practice in 20 constructive challenges. Dodo Does Math is suited for second to fourth Graders and adheres to the Common Core Math Standards Alignment. hello, in the full version, how many are the exercises?